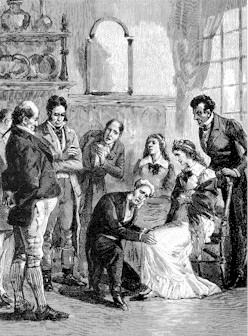 Modern Spiritualism is recognized as having begun in 1848, with the phenomena at Hydesville, however, the supernatural experiences of the Swedish Seer Emanuel Swedenborg in 1744, actually ushered in a new spiritual era, but did not get the recognition that it warranted. Emanuel Swedenborg was one of Europe's greatest minds, and considered today to be one of the three greatest minds in all of history. In 1744, he was brought to the spirit world by Jesus to learn his truths, and upon his return wrote, The Heavenly Doctrine to reform Christianity. Swedenborg had been selected because a mortal was needed, who would be respected among the thinkers of the day to be the herald of Jesus's spiritual revelation. 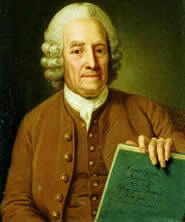 Swedenborg was such a man, having an eclectic mind and learned in mathematics, geology, chemistry, physics, mineralogy, anatomy and astronomy. He was one of the outstanding and respected scientists of his time, and a member of Sweden's House of Nobles. Swedenborg did indeed travel to the spirit world, still attached to his silver cord, to learn the higher spiritual truths. This inspired him to devote the latter quarter-century of his life to writing eighteen published theological works, and several more which were unpublished. He spoke of founding a 'New Church', that would be based on the works he was writing of his experiences while out of his body. His most well known work, Heaven and Hell was published in 1758 and, since then, many persons including a variety of important cultural figures, both writers and artists were influenced by Swedenborg's writings. Included are: Robert Frost, Johnny Appleseed, William Blake, Jorge Luis Borges, Daniel Burnham, Arthur Conan Doyle, Ralph Waldo Emerson, John Flaxman, George Inness, Henry James Sr., Carl Jung, Immanuel Kant, Honoré de Balzac, Helen Keller, Czesław Miłosz, August Strindberg, D. T. Suzuki and W. B. Yeats. 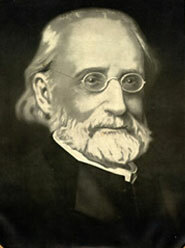 Considered the John the Baptist of Spiritualism, Andrew Jackson Davis was a prolific spiritualist author and proclaimer of the coming revelation of Spiritualism. Davis grew up in the small town of Poughkeepsie, along the Hudson River in New York State. Young Davis showed signs of clairvoyance and heard voices, and in 1844, had an experience that changed his life. On the evening of March 6th, he experienced a trance-like state, and when he gained full consciousness the next morning, he was some forty miles from where he had entered the trance. Davis claimed, during this time, to have met the spirits of Galen, the Greek physician and Swedenborg, the Seer. Davis may have had a vision or been teleported or perhaps he walked the distance while in trance – no one can say for certain. Regardless of what occurred, the effect on him was profound, and afterwards, he traveled extensively, lecturing and authoring thirty books that became the philosophical foundation of early American Spiritualism. In 1847, Davis predicted that it would not be long before the afterlife would be proven. His validation came a year later in Hydesville, New York with the phenomena later known as the 'Hydesville Rappings'. During the month of March 1848, strange knocking noises began to plague the Fox family shortly after they moved into a two-room cottage on a small piece of land at Hydesville, New York, south of Rochester. The cottage was intended to be a temporary home while a suitable family home was being built adjacent to an uncle's property. Strange knocking sounds began to be heard in 1848. Neither the Foxes' nor their neighbors were able to determine the origin of the sounds, and, not only could the knocks be heard, but those who were present could feel the cottage disturbed. So, just to have fun, the two young girls started talking to the unknown entity and gave it a name 'Mr. Splitfoot', which is a nickname for the devil. Surprising to them it answered back with loud rapping sounds. A communication was established with a question from the girls and an answer from the discarnate entity a simple one rap for yes, two raps for no. Then the family's eldest son David who lived in Rochester can to see and devised an alphabet code whereby he would recite the letters of the alphabet and when he reached the correct letter Mr. Splitfoot would rap back one or two. Though laborious, words could be spelled out and it was learned that the unearthly sounds came from the spirit of a travelling Jewish peddler named, Charles B. Rosna. 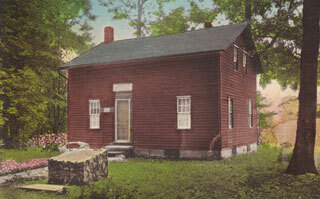 He had been robbed and murdered by the previous occupant, a Mr. Bell, and his remains were buried in the cellar. It was learned that the peddler had left a wife and five children behind and had no way of knowing what happened to him. The noises presumably were an attempt to contact his family by having the Foxes' inform them of his demise. His sudden and unexpected death left unfinished business which caused the peddler to remain earthbound and to haunt the Fox cottage. Digging by the neighbors commenced in the cottage cellar, but the mud from the spring flooding prevented any immediate discovery. In the summer the digging continued and bits of teeth, bone fragments and the peddler's tin box (where he kept valuables) were unearthed. I personally saw these artifacts on display in 1989, in the basement museum of Lily Dale's Skidmore Library. 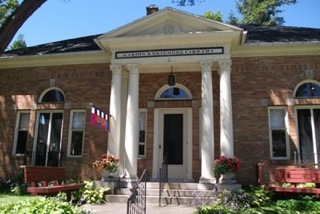 However, when the old school house was converted into a permanent museum the artifacts had not made the transition and disappeared. When I made inquiries I found that this was a very sensitive subject at Lily Dale. People came from miles around to Hydesville to investigate the phenomenon. This eventually became a distraction that overwhelmed the Fox family to the point where they could not tend to their daily affairs. So, they decided to move to Rochester where their son David lived. The spirit peddler followed and continued making contact with the sisters. The noises could hear by all, but no one could explain them. 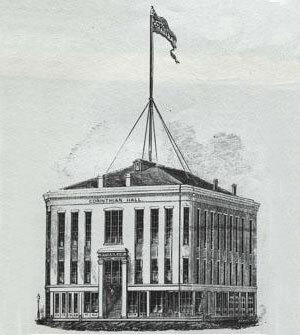 On November 14, 1849, supportive friends arranged for a public demonstration at the Corinthian Hall, the city's largest assembly. The sisters demonstrated the peddler's rapping, which was the first demonstration of psychic phenomena held before a paying audience, and inaugurated a long history of public events to come by spiritualist mediums. Prior to taking the stage a committee of leading citizens was appointed to investigate the sisters before the demonstration. The committee determined that the girls were making the rapping sounds by cracking their knee, ankle or toe joints. Regardless, they passed every test and the committee had no alternative, but to declare the phenomenon authentic and allowed the girls to preform. 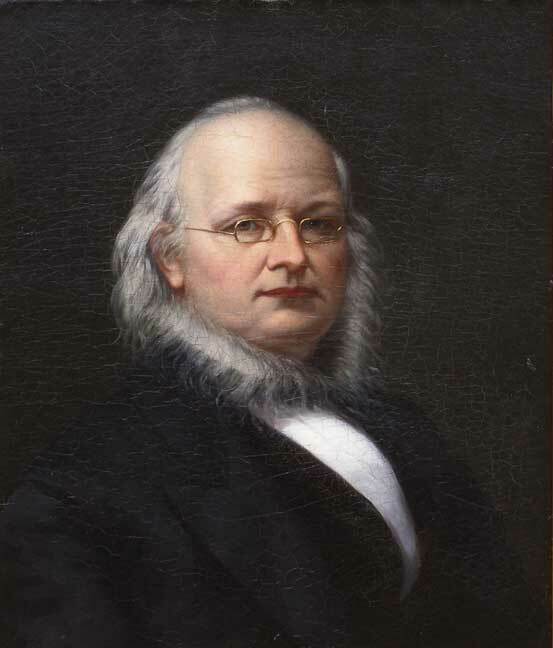 The sister's act was so successful that Horace Greeley founder and editor of the New York Tribune received a letter sent to the paper informing him of the Rochester phenomena. Greely had lost a son and was willing to look into the matter. He dispatched a reporter, Charles Partridge, to investigate, who returned with a favorable report. 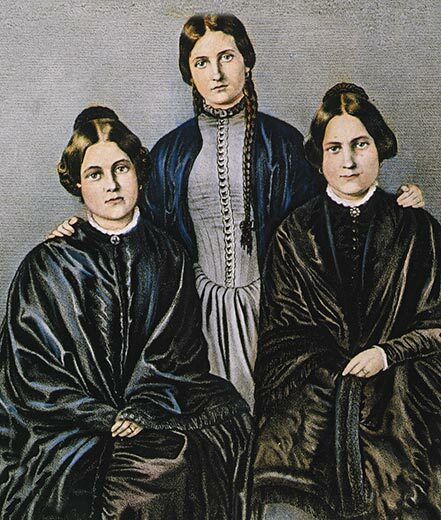 Greely, then arranged for the sisters, and their mother as chaperon, to come to New York City, where further examination took place by the scientific community. Greeley produced public demonstrations at a theatre off Broadway where the girl's performances caused a sensation and were responsible for bringing psychic phenomenon to the forefront of the American scene. The Hydesville Rappings were by no means the first reported supernatural knocks in history, but what made them unlike the others was the publicity given them by Greeley and his newspaper. In the end, Greeley stated, "I am convinced that the sounds and manifestations were not produced by Mrs. Fox or her daughters, nor by any human being connected with them." Horace I. Greeley was born in Amherst, New Hampshire, in 1811, where he trained as a printer. He later moved to New York City and became a journalist working for the New Yorker, and in 1841 he established the New York Tribune, a newspaper he edited for over thirty years. Greeley he served briefly as a congressman from New York, and was the unsuccessful candidate of the new Liberal Republican party in the 1872 presidential election against incumbent President Ulysses S. Grant. He had a strong moral tone and used his paper to campaign against alcohol, tobacco, gambling, prostitution, capital punishment and slavery. He is perhaps best remembered for the phrase, "Go West, young man go West." With the Fox Sisters manifestations now the talk of the town, other mediums no longer had reason to fear ridicule and condemnation. Séances began popping up throughout New England, and communication with the departed became popular and fashionable, as something new and exciting among the middle and upper classes. 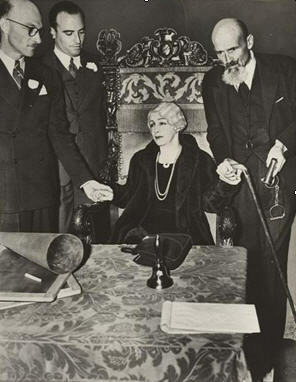 Spiritualism grew rapidly and became so popular that in 1926 an anti-fortunetelling bill was introduced in Washington. If passed, it would have outlawed the psychic arts for monetary gain, making it punishable by a fine and/or imprisonment. Harry Houdini had even testified before a congressional subcommittee against the spiritualist mediums, however, because of the constitutional guarantee of religious freedom the proposed ban failed to pass Congress. In 1856, under contract to a theatrical company, Emma Hardinge Britten sailed from Southampton, England to New York City. There, through the mediumship of Miss. Ada Hoyt, Emma converted to Spiritualism and was to become one of its most important advocates. Born in London in 1823, the daughter of a sea captain, she was a talented musician and singer. Her mediumistic gifts included automatic and inspirational writing, psychometry, healing, prophecy and inspirational speaking. Emma was unequaled in her zeal, commitment and enthusiasm for she travelled in Great Britain, the United States, Canada, Australia and New Zealand expounding the philosophy of Spiritualism. 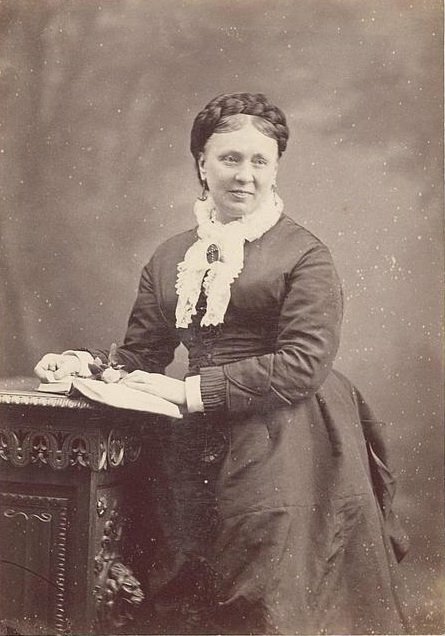 Emma is said to be responsible for having received through her mediumship in 1871, at least the first four of the seven original principles of Spiritualism; from Robert Dale Owen, an American statesman then in the spirit world. The principles are used today by the British spiritualists and in the Commonwealth Countries, the American Association drafted its own ten principles in an effort to remove the religious aspects from the principles. 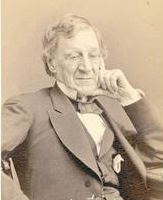 A principle pioneer of Spiritualism, Judge John W. Edmonds was chief justice of the New York State Supreme Court. In 1851, Judge Edmonds began investigating mediums and witnessed several hundred physical manifestations in various forms keeping very detailed records. When Judge Edmonds went public with his findings in a book in 1853, simply titled, Spiritualism, he was attacked by the press, the pulpit, the politicians and was forced to resign his post on the bench and return to private practice. 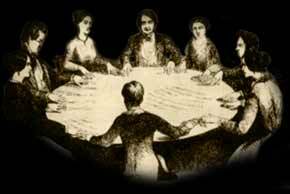 The president's wife, Mary Todd Lincoln, began exploring Spiritualism after the death of their 11 year-old son Willie, by visiting mediums and sitting in circles. The President took a passing interest in the phenomena and later became an advocate. 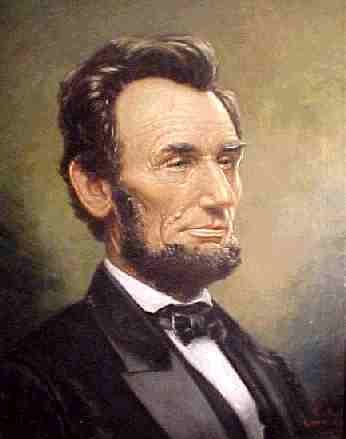 There are claims that Abraham Lincoln the 16th President received guidance from spirits who communicated through mediums in crucial decisions of national importance during the American Civil War years. There exists a story that at one sitting, Nettie Colburn, the Presidents personal medium went into trance, and spoke about the President's duty to free the slaves. There is also hearsay that there was spirit influence in Mr. Lincoln's most profound works - the Gettysburg Address and the Emancipation Proclamation. Spiritualism gave rise to a belief in spirit contact, which appealed to many celebrated people of the time: Elizabeth Barrett Browning, William Cullen Bryant, Thomas Carlyle, Emily Dickinson, Sir William Crookes, Edgar Allen Poe, Alfred Russell Wallace, Mark Twain, Harriet Beecher Stowe, Queen Victoria, and W. B. Yeats were all investigators and proponents of this new spiritual science. Harry Houdini was Spiritualism's greatest antagonist. He was born Erich Weiss in Budapest, Hungary, in 1874, the son of a rabbi. His family immigrated to America in 1878, and Houdini began performing at the age of nine with a trapeze act, then magic and, in 1893, began experimenting with the escape arts. He became widely known as 'The Handcuff King', and in 1900 he toured England, Scotland, the Netherlands, Germany, France and Russia. With his success, his interests expanded and, in 1918, he signed a film contract and went to Hollywood to appear in films, and lived in a mansion in Laurel Canyon. In the 1920s, after the death of his mother Cecilia, he turned his interest toward making contact with her and eventually to debunking the spiritualist mediums. His training and background in magic allowed him to expose fraud that had successfully eluded scientists and academics. 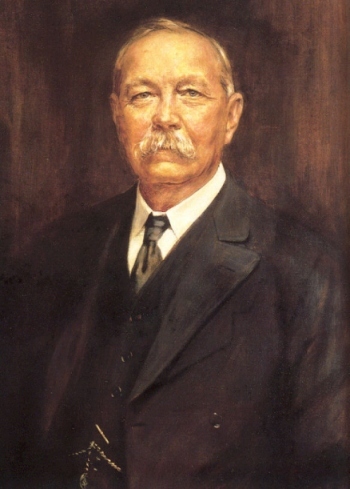 Arthur Conan Doyle was born in Scotland, where he studied medicine at the University of Edinburgh. He practiced as a physician specializing in conditions of the eye. In 1902, Edward VII knighted him for his role in the Boer War in South Africa. Doyle's first Sherlock Holmes story, A Study in Scarlet was published in 1887, and he eventually became wealthy through the popularity of the series. He had an insatiable interest in psychic phenomena and dedicated the latter part of his life to the advancement of Spiritualism lecturing worldwide and becoming the movement's most renowned proponent. 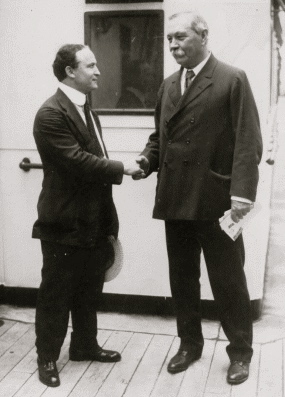 Sir Arthur and Houdini met in 1904 while Houdini was performing at the Brighton Hippodrome. Both men were world famous, although their careers were very different. Their mutual interest in the paranormal brought them together and they had great respect for one another. Sir Arthur invited the Houdini and his family to his home in Sussex, and a close friendship ensued. 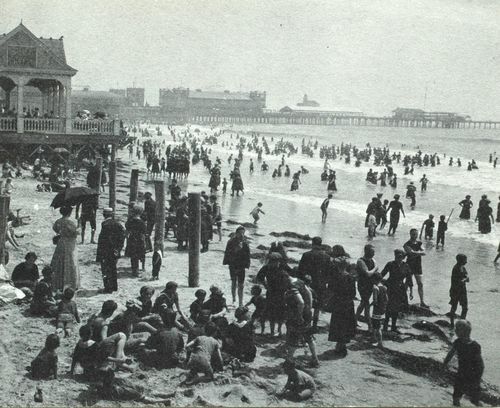 In June of 1922, Sir Arthur and his family were on a lecture tour of the East Coast of America, the weather was hot, and the Doyle's decided to take a brief holiday in Atlantic City, New Jersey They invited the Houdini's to join them. 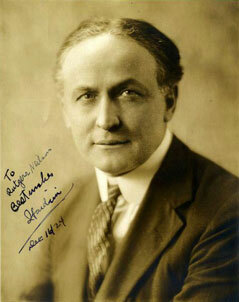 While there, Houdini spoke touchingly of his mother who had passed in 1913. Sir Arthur suggested to his wife, Lady Doyle, who was an automatic writing medium that she try to receive a message for Houdini from his mother, which she did. "Oh, my darling thank God, thank God, at last I am through. I've tried, oh so often. Now I am happy. Why, of course, I want to talk to my boy, my own, beloved boy. Friends, thank you, thank you, with all my heart for this. You have answered the cry of my heart and of his. God bless him a thousand fold, for all his life for me - never had a mother such a son. Tell him not to grieve soon he will get all the evidence he is anxious for. I want him to know that I have bridged the gulf, which is what I wanted, oh so much. Now I can be in peace." I. His mother could not speak or write English. However, in Spiritualism, it is generally accepted that spirits can readily learn other languages. II. Lady Doyle had the habit of drawing a cross on the top of the page for protection before she wrote a letter from a spirit. Houdini, being the son of a rabbi, was not about to accept a cross or anything to do with Christianity to be connected with his mother. III. 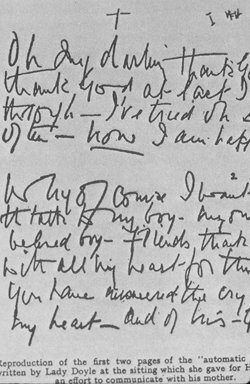 The writing session had taken place on his mother's birthday June 17th, but there was no mention of the significance of this date during the contact. Sir Arthur insisted that the message was genuine, Houdini felt a mockery had been made of his deepest feelings and their friendship was at an end never to be restored. Houdini continued attempts to contact his mother through spiritualist mediums, but, time after time he experienced fraud in the séance room. He became so outraged that he launched a campaign to expose fraudulent mediums. Houdini was world-renowned, and with word of his exposures well-known, he had to disguise himself to be admitted into séances. When he deduced how the trickery was done, he would jump to his feet and shout loudly, "I am Houdini, and you are a fraud." 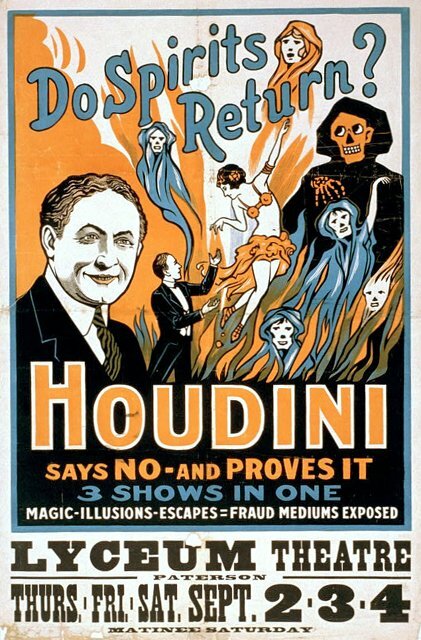 Houdini even had a stage act debunking psychic phenomena, showing the audience how the phenomena were produced by mechanical trickery. His show was a sensation and contributed to the public's distrust of mediums. In 1926, after receiving an unexpected blow to the abdomen, Houdini died leaving it known that he had prearranged a coded message with his wife, Beatrice, which only she knew. Arthur Ford of Georgia developed his psychic abilities during World War I, while in the army. 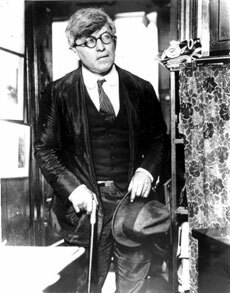 In 1927, he traveled to Great Britain where Sir Arthur Conan Doyle remarked, "One of the most amazing things I have ever seen in forty-one years of psychic experience was the demonstration by Arthur Ford." In 1928, Ford went into trance, and his spirit guide Fletcher, a Canadian lad, announced that there was a woman present whom he had not seen before and that she was eager to make contact. The woman said, "I am the mother of Harry Weiss (Houdini), and for many years my son has waited for one word that I was to send back, and that word is 'forgive'. Now my son will be able to communicate for himself." Houdini's widow Beatrice was notified, and a series of ten sittings were arranged during which Arthur Ford brought the code through to Mrs. Houdini from her husband. LOOK ** TELL ANSWER ** ANSWER ** TELL. The code made headlines. The press accused Mrs. Houdini of giving it to Arthur Ford in advance of the sittings. 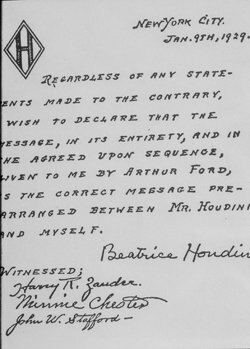 She defended herself in this letter saying, "Regardless of any statement made to the contrary, I wish to declare that the message, in its entirety and in the agreed-upon sequence given to me by Arthur Ford, is the correct code prearranged between Mr. Houdini and myself." She further stated that she did not need money and had no intentions of going on stage, nor, as some newspapers suggested, a lecture tour. Nevertheless, the power of the press convinced the public that the code was not properly given. Mystery still surrounds Houdini in that Mrs. Houdini would hold a séance each anniversary of her husband's death (Halloween Eve) comprised of friends and magic colleagues. The séances went on until 1936, below is a photograph of the final séance held at the rooftop room of the once famous Knickerbocker hotel in Hollywood. The sitters pleaded with Houdini to come through, but to no avail, a response was never received. With the code discredited by the press and Houdini failing to make his presence known at his wife's séances the consensus of the general public was if Houdini couldn't prove an afterlife, there must not be one. This resulted in the public's further loss of confidence in Spiritualism, which contributed sharply to its decline and near disappearance in America. Spiritualism exists today predominantly in the English speaking countries. In America there are five spiritualist camps that have seasons. 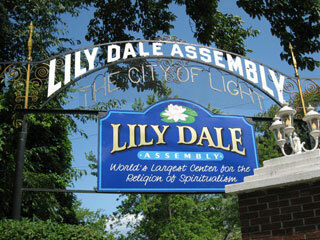 Lily Dale in New York is the largest, and is the headquarters for the National Spiritualist Association of Churches, which has spiritualist churches in many parts of the United States. 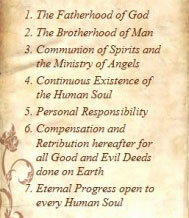 Great Britain is considered the world hub of Spiritualism. It has more spiritualist churches, mediums, centres, colleges and publications than the rest of the world combined. 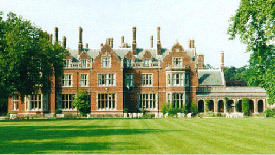 Its showplace is the Arthur Findlay College at Stansted Hall in Essex, owned by the worlds largest spiritualist association, the Spiritualists National Union. If you would like to learn more about the history of Spiritualism, a plethora of information can be found by researching the internet. There are also many books on the subject, Sir Arthur Conan Doyle's two-volume set The History of Spiritualism may be the most comprehensive and well written.